Maria Alexander joins the Virtual Memories Show to talk about her debut novel, Mr. Wicker , her intern/protege relationships with Clive Barker and Neil Gaiman, and the art of shinkendo swordplay and what George R.R. Martin gets wrong about swords. Also, we learn what happens when Lovecraftian pastiche goes wrong, how Maria realized that even geniuses have to write drafts, how her parents took syncretism to new heights, how Mr. Wicker made its way from short story to screenplay to first novel, how she deals with severe carpal tunnel syndrome, and what her love of swords has taught her about editing her work! Give it a listen! Maria Alexander writes pretty much every damned thing and gets paid to do it. She’s a produced screenwriter and playwright, published games writer, virtual world designer, award-winning copywriter, interactive theatre designer, prolific fiction writer, snarkiologist and poet. Her stories have appeared in publications such as Chiaroscuro Magazine, Gothic.net and Paradox, as well as in acclaimed anthologies alongside legends such as David Morrell and Heather Graham. Her second poetry collection – At Louche Ends: Poetry for the Decadent, the Damned and the Absinthe-Minded – was nominated for the 2011 Bram Stoker Award. And she was a winner of the 2004 AOL Time-Warner “Time to Rhyme” poetry contest. When she’s not wielding a katana at her local shinkendo dojo, she’s being outrageously spooky or writing Doctor Who filk. She lives in Los Angeles with two ungrateful cats, a pervasive sense of doom, and a purse called Trog. 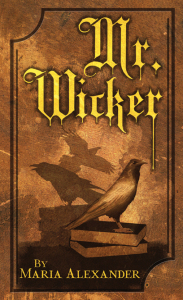 Her new novel is Mr. Wicker (Raw Dog Screaming Press). Credits: This episode’s music is Ironside (Excerpt), Battle Without Honor or Humanity, The Chase, and Woo Hoo from the Kill Bill soundtrack. The conversation was recorded at Ms. Alexander’s home on a pair of Blue enCORE 200 microphones feeding into a Zoom H5 digital recorder. The intro and outro were recorded on a Blue Yeti USB Microphone . Processing was done in Audacity and Garage Band. Photo of Ms. Alexander by me. This is wonderful, Gil! Thank you so much. After our talk, I realized that actually I had been off of Shinkendo practice 1.5 years, rather than just a year. That’s a long time, but I was still involved with the dojo the entire stretch. Anyway, you’re the best! Take care.